This position includes work to harness parallel processing and automatic differentiation, to generate interfaces with other languages such as Python, to improve NIMBLE’s scope and efficiency for large statistical models, and to build other new features into NIMBLE. The work will involve programming in R and C++, primarily designing and implementing software involving automated generation of C++ code for class and function definitions, parallel computing, use of external libraries for automatic differentiation and linear algebra, statistical algorithms and related problems. The position will also involve writing documentation and following good open-source software practices. This example shows how to construct and conduct inference on a state space model using particle filtering algorithms. nimble currently has versions of the bootstrap filter, the auxiliary particle filter, the ensemble Kalman filter, and the Liu and West filter implemented. Additionally, particle MCMC samplers are available and can be specified for both univariate and multivariate parameters. where denotes a normal distribution with mean and standard deviation , and is a shifted, scaled -distribution with center parameter , scale parameter , and degrees of freedom. We next construct a bootstrap filter to conduct inference on the latent states of our state space model. Note that the bootstrap filter, along with the auxiliary particle filter and the ensemble Kalman filter, treat the top-level parameters a, b, sigPN, and sigOE as fixed. Therefore, the bootstrap filter below will proceed as though a = 0, b = .5, sigPN = .1, and sigOE = .05, which are the initial values that were assigned to the top-level parameters. The bootstrap filter takes as arguments the name of the model and the name of the latent state variable within the model. The filter can also take a control list that can be used to fine-tune the algorithm’s configuration. ## run compiled filter with 10,000 particles. 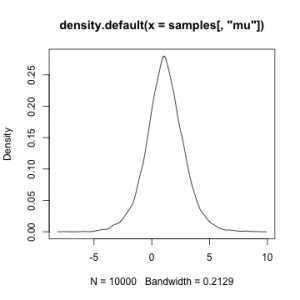 ## note that the bootstrap filter returns an estimate of the log-likelihood of the model. Particle filtering algorithms in nimble store weighted samples of the filtering distribution of the latent states in the mvSamples modelValues object. Equally weighted samples are stored in the mvEWSamples object. By default, nimble only stores samples from the final time point. The auxiliary particle filter and ensemble Kalman filter can be constructed and run in the same manner as the bootstrap filter. 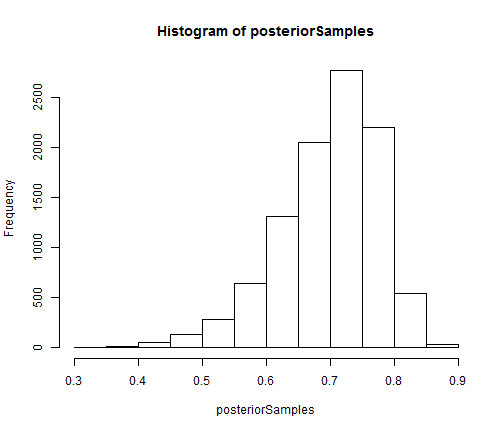 The above RW_PF_block sampler uses a multivariate normal proposal distribution to sample vectors of top-level parameters. To sample a scalar top-level parameter, use the RW_PF sampler instead. Version 0.6-3 is a very minor release primarily intended to address some CRAN packaging issues that do not affect users. We also fixed a bug involving MCEM functionality and a bug that prevented use of the sd() and var() functions in BUGS code. NIMBLE version 0.6-1 has been released on CRAN and at r-nimble.org. Write general hierarchical statistical models in BUGS code and create a corresponding model object to use in R.
Build Markov chain Monte Carlo (MCMC), particle filters, Monte Carlo Expectation Maximization (MCEM), or write generic algorithms that can be applied to any model. Compile models and algorithms via problem-specific generated C++ that NIMBLE interfaces to R for you. Extend BUGS with functions and distributions you write in R as nimbleFunctions, which will be automatically turned into C++ and compiled into your model. Program with models written in BUGS code: get and set values of variables, control model calculations, simulate new values, use different data sets in the same model, and more. Write your own MCMC samplers as nimbleFunctions and use them in combination with NIMBLE’s samplers. Write functions that use MCMC as one step of a larger algorithm. Use standard particle filter methods or write your own. Combine particle filters with MCMC as Particle MCMC methods. Write other kinds of model-generic algorithms as nimbleFunctions. Compile a subset of R’s math syntax to C++ automatically, without writing any C++ yourself. Some early versions of NIMBLE were not on CRAN because NIMBLE’s system for on-the-fly compilation via generating and compiling C++ from R required some extra work for CRAN packaging, but now it’s there. Compared to earlier versions, the new version is faster and more flexible in a lot of ways. Building and compiling models and algorithms could sometimes get bogged down for large models, so we streamlined those steps quite a lot. We’ve generally increased the efficiency of C++ generated by the NIMBLE compiler. We’ve added functionality to what can be compiled to C++ from nimbleFunctions. And we’ve added a bunch of better error-trapping and informative messages, although there is still a good way to go on that. Give us a holler on the nimble-users list if you run into questions. Version 0.5-1 of NIMBLE released! Please see the NEWS file in the source package. Yesterday we released version 0.5 of NIMBLE on our web site, r-nimble.org. (We’ll get it onto CRAN soon, but it has some special needs to work out.) NIMBLE tries to fill a gap in what R programmers and analysts can do with general hierarchical models. Packages like WinBUGS, OpenBUGS, JAGS and Stan provide a language for writing a model flexibly, and then they provide one flavor of MCMC. These have been workhorses of the Bayesian revolution, but they don’t provide much control over how the MCMC works (what samplers are used) or let one do anything else with the model (though Stan provides some additional fitting methods). The idea of NIMBLE has been to provide a layer of programmability for algorithms that use models written in BUGS. We adopted BUGS as a model declaration language because these is so much BUGS code out there and so many books that use BUGS for teaching Bayesian statistics. Our implementation processes BUGS code in R and creates a model object that you can program with. For MCMC, we provide a default set of samplers, but these choices can be modified. It is easy to write your own sampler and add it to the MCMC. And it is easy to add new distributions and functions for use in BUGS code, something that hasn’t been possible (in any easy way) before. These features can allow big gains in MCMC efficiency. MCMCs are heavily computational, so NIMBLE includes a compiler that generates C++ specific to a model and algorithm (MCMC samplers or otherwise), compiles it, loads it into R and gives you an interface to it. To be able to compile an algorithm, you need to write it as a nimbleFunction rather than a regular R function. nimbleFunctions can interact with model objects, and they can use a subset of R for math and flow-control. Among other things, the NIMBLE compiler automatically generates code for the Eigen C++ linear algebra library and manages all the necessary interfaces. Actually, NIMBLE is not specific to MCMC or to Bayesian methods. You can write other algorithms to use whatever model you write in BUGS code. Here’s one simple example: in the past if you wanted to do a simulation study for a model written in BUGS code, you had to re-write the model in R just to simulate from it. With NIMBLE you can simulate from the model as written in BUGS and have complete control over what parts of the model you use. You can also query the model about how nodes are related so that you can make an algorithm adapt to what it finds in a model. 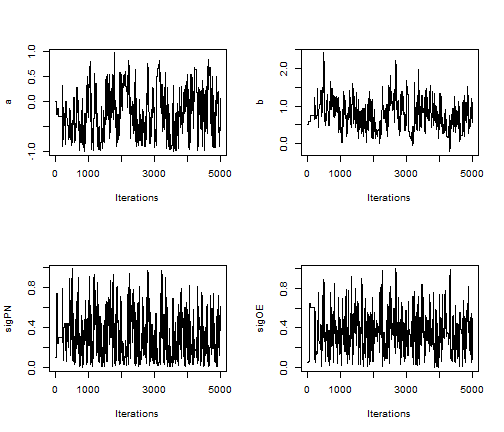 We have a set of sequential Monte Carlo (particle filter) methods in development that we’ll release soon. But the idea is that NIMBLE provides a platform for others to develop and disseminate model-generic algorithms. NIMBLE also extends BUGS in a bunch of ways that I won’t go into here. And it has one major limitation right now: it doesn’t handle models with stochastic indices, like latent class membership models. 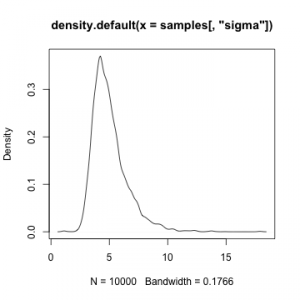 Here is a toy example of what it looks like to set up and run an MCMC using NIMBLE. Our paper giving an overview on the rationale and design of NIMBLE has appeared online in accepted manuscript form at the Journal of Computational and Graphical Statistics. You can get it here. We’ve just released the next major version of NIMBLE. More details in the NEWS file that accompanies the package. We anticipate being on CRAN in coming weeks and a next release soon that will include a full suite of sequential Monte Carlo (i.e., particle filtering) algorithms. We’ve just released version 0.4-1, a minor release that fixes some logistical issues and adds a bit of functionality to our MCMC engine. Thanks to r-bloggers (and their feed).